I love Kubo Tite’s coloured pages. They show his characters in a variety of out-of-character attires and situations, but never-the-less manages to keep them cool. I’d like to see some of the less popular characters though – can’t argue against Ichigo, since he’s the protagonist, but Renji and Urahara appears too often. Where’s my Soi Fong, Uruu-chan, or Isshin? Ichigo goes back to school, and gets chewed out by his teacher about being absent for a month. Keigo is as wastefully energetic as ever, but Ichigo is completely pre-occupied with Orihime. Tatsuki confronts him about Orihime’s disappearance and his appearance as a Shinigami, but Ichigo brushes all her accusations aside, saying “It has nothing to do with you.” In her anger Tatsuki punches Ichigo, and its apparent that she’s as angry about how distant Ichigo is acting as she’s worried about Orihime’s disappearance. Ichigo’s only response to this is “Don’t come close to me anymore”. Night comes, and Ichigo approaches Urahara to find a way to Hueco Mundo. He finds Sado and Ishida already waiting, but once again he tries to push away their support. 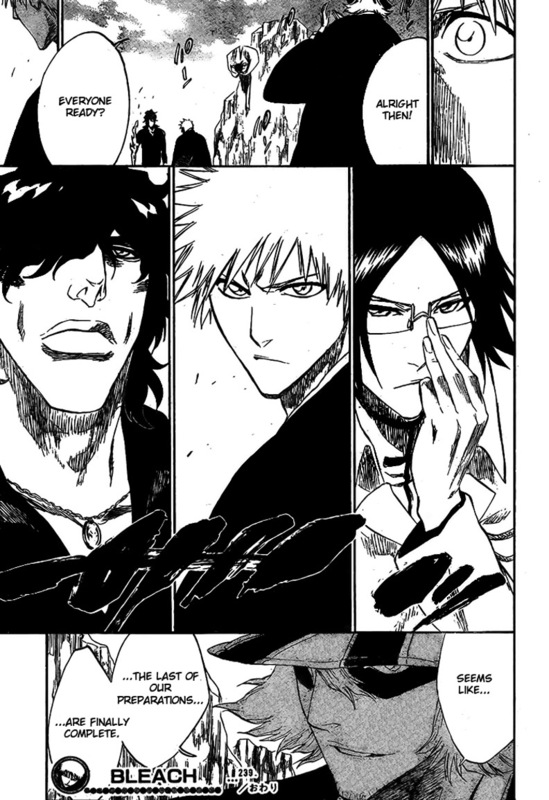 Sado shows off his improved power, and together with Ishida offers Ichigo company to Hueco Mundo. I don’t believe this aspect comes from his confidence in his ability, or pride or even arrogance, but it’s a result of what happened in his childhood (see volume 3). It’s one of Ichigo’s fatal flaws. He doesn’t want anyone close to him to get hurt again because of his own reckless actions. It seems that he knows what he’s doing is reckless and dangerous, but he doesn’t seem to be aware that his mum died because he didn’t rely on her, and that it’s possible that the same might happen again. I’m easily amused. I have to repeat this everytime I write a review because it’s so easy to get me excited (no, get your mind out of the gutter), but this time it’s the same. Personally I think this chapter was handled very well – very emo yes, but emo isn’t neccessarily always bad. The expression on each character’s face are expressive and sets the tone very nicely. In particular I like the treatment of Keigo and Mizuiro, as they each try to cheer up Ichigo in their own unique ways. Tatsuki’s confrontation was handled decently as well, especially her reaction after she was told that Ichigo’s problems have nothing to do with her. I also like the emphasis under Ichigo’s eyes – you can see that he’s stressed and worried without any exaggeration. I guess what attracts me to Bleach are its characters and relative realism. Although not all characters have that same level of depth, most of the characters feel like they’re real people. I particularly like the little side stories for Mizuiro and Sado, and Keigo is a personal favourite, not because of his hyperactivity, but because sometimes we see a deeper side to him outside of his clown mask. 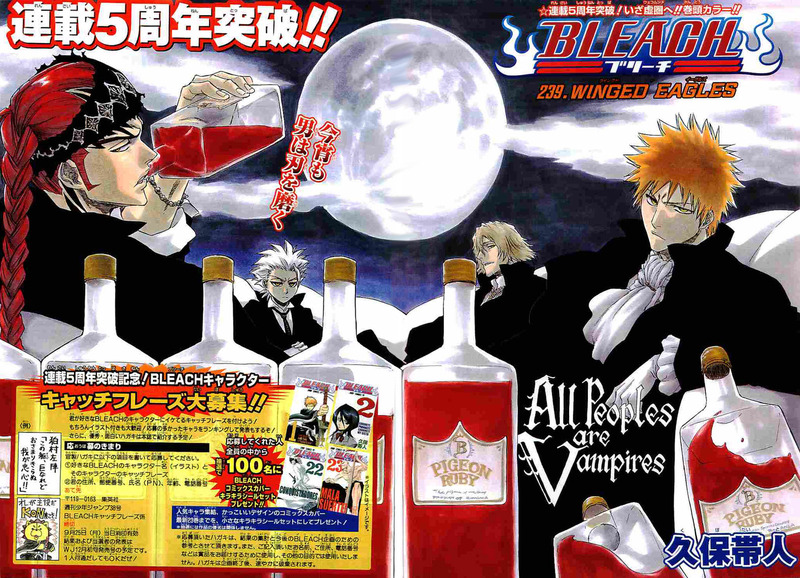 Initially I thought the title of this chapter and the last refers to Ichigo without a way to Hueco Mundo, but it’s clear from this issue that the wings refer to his friends (or friendship). The last chapter left Ichigo all alone with no support, emotionally or physically, hence the name “Eagle without wings”. In this chapter we see Ichigo, Sado and Ishida together again, and with each others’ support they are “Winged Eagles”. Finally, it’s good to see Sado power-up. His performance in Soul Society is worse than pathetic. Hopefully he’ll do better this time around – the Arankaru won’t be as merciful as the Shinigami.